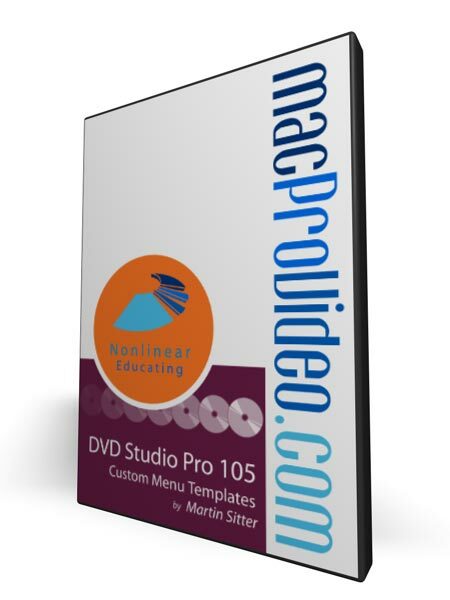 DVD Studio Pro's built-in templates and transitions make it easy to create an enhanced DVD-Video presentation. But to really experience the power of templates, you need to know how to build your own custom templates! Templates let you quickly and effitiently build a "look" or a "flow" for a project. 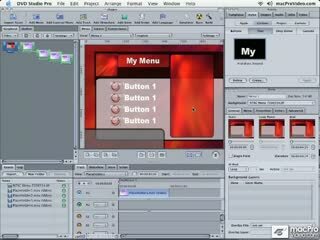 A good menu template is just a cleverly designed background movie with button shapes placed on top. 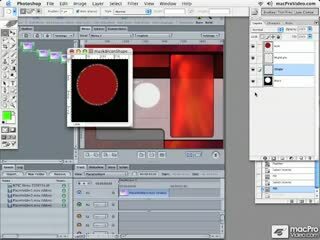 In this program you'll learn how to make both, and use them to full effect. The program finishes with a detailed description of applying templates to Chapter Menus. 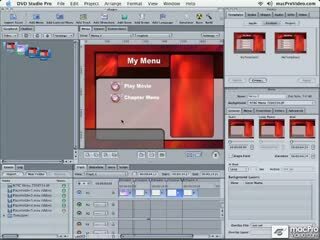 You'll even learn how to use DVD Studio Pro's Special Template Buttons to automatically link chapter menus together! There's a lot to learn ... check out the table of contents by cicking the link below. Very good tutorial, short but very clear. I definitely recommend it if you are thinking on watching it. It is worth the time spent. Hi, i found it very useful but i think it needed to be more crearive. Great Video, I thought it was about using the existing templates but i was wrong, Oh well I learned a great deal of menu creation and how to assemble a menu from litteraly a blank page in photo shop.. Amazing. My room mate bought me a tutorial in the form of a book and I still have not been able to get thru it. This Has helped me a great deal. Thanks.. 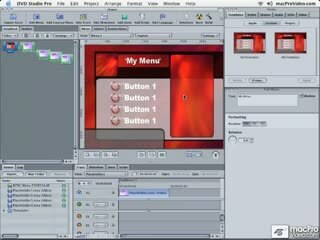 I needed to produce a custom DVD menu. DVDSP has many templates, but I needed a certain look on this project. 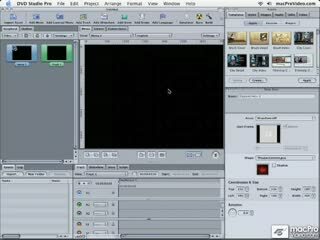 Watching the MPV tutorials help sort through the many options of DVDSP and made making a custom template very easy. And I actually understood what I was doing in the process....Thanks MPV! 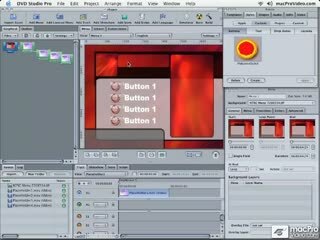 This tutorial is at about the same level of the 101 course but goes into detail on how to make your own custom templates and buttons in DVDSP. 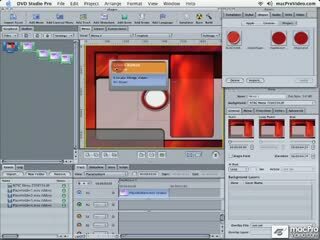 I used to use iDVD for sending out quick client review copies, always fighting it and manually adjusting the templates with custom backgrounds, text styles, colors and such--and generally wasting a lot of time trying to trick "easy to use" software to do what I wanted to. Meanwhile, DVDSP was sitting in my kit the whole time, unused because it seemed so complicated and because it used to be you had to compress everything before you could bring it into DVDSP--and that seemed sort of daunting. 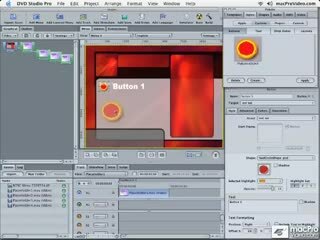 Today's DVDSP fixes all those issues I had been fighting iDVD and lets me create fully populated and branded templates they way I want, with completely custom buttons with drop zones and overlays. And you can auto populate chapter menues and even automatically create chapter menu nav buttons using your template. 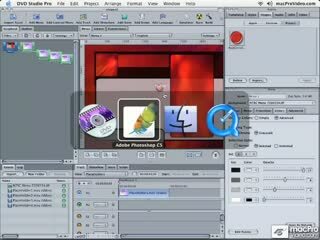 This tutorial teaches you how to do all of that and is really the final touch I needed to make DVDSP an everyday app and not just something you'll use to master published titles. 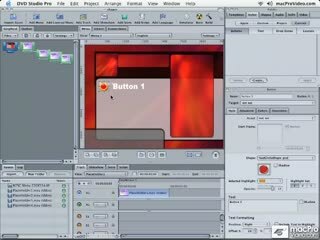 The instructor's deep product knowledge really shows through as he carefully shows you where all the hidden files are and anticipates pitfalls you may encounter. It is clear he teaches real people on a regular basis and incorporates feedback in his training. Definitely recommended as an adjunct to 101. There is still room for improvement, of course. While I really like the fact that you can start downloading and learing imediately I'd like to see the segments in longer chunks. Some were as short as 30 seconds, each with a head and tail bumper, sometimes so hastily added that there are flash frames and cutoff audio in the dissolves. Also, I find the occasional onscreen bullet points to be more distracting than helpful as they tend to split my focus rather than re-enforce the message. Overall, these training videos feel like they were captured from a live presentation on a laptop and haven't been proofread and edited for the occasional trivial glitches, such as the instructor repeatedly calling the font "Big Caslon" as "Big Carlson." (Perhaps it is pronounced as such? Sometimes things have funny pronunciations one wouldn't guess at, but I don't think this is one of those times.) However, one moment the instructor will be making a minor flub and the next he'll be wowing you. It would be good to catch and edit these flubs out just to keep the "wow" going... Thanks to the high resolution movie format you can see everything just fine, but I do like productions that zoom, when appropriate, on various areas of the screen to make the instruction easier to follow. 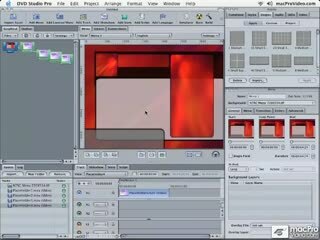 Additionally, the instructor occasionally referred to things such as "this is just like we did in module 2," which seems to be an old name for things that are now in 101. While this didn't detract from the instructional value it once again reenforces the seeming lack of attention to post production detail. You'll still learn just as much, though. And between 101 and 105 it is amazing how much of the DVDSP book is covered. 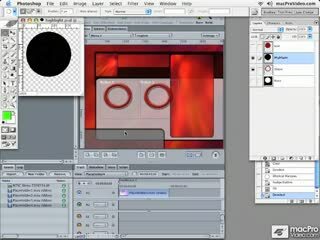 You'll save a lot of time and frustration by using these two tutorials. 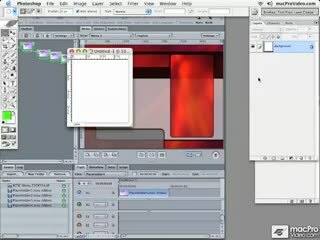 Looking forward, an additional tutorial on basic scripting is probably warranted. 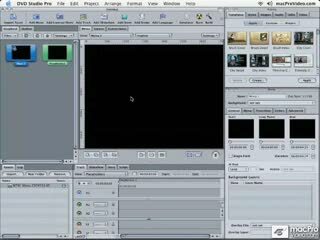 And the course descriptions should be updated to explain how 101 and 105 pertain to DVDSP 3 vs 4, especially since the "advanced" video is for the separate A.Pack app that is no longer needed or sold with DVD SP thanks to the inclusion of AC-3 audio compression (finally) in Compressor and makes the 101 and 105 seem like they might be out of date even though they are still very much relevant and the start up screen in 101 is DVDSP 3.